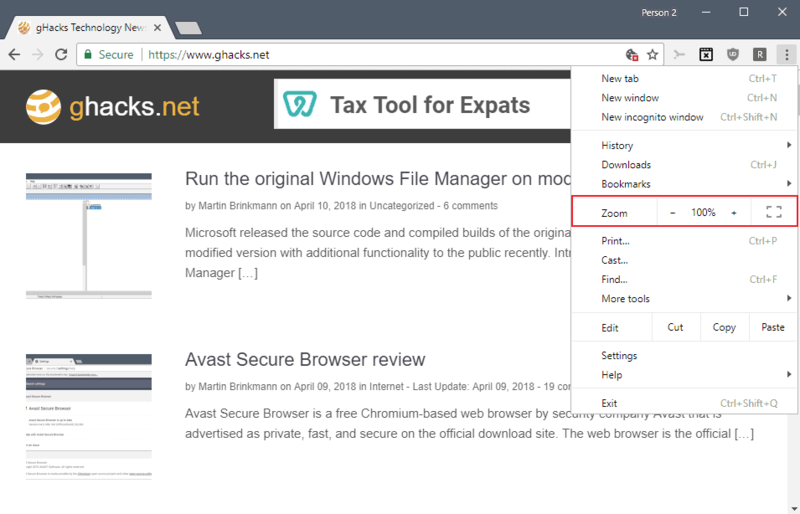 Google Chrome supports native zoom functionality that users of the browser may utilize to change the size of text and media elements such as images on webpages. Chrome's zoom capabilities can be divided into two core features: changing the size of text and media content on a single webpage or on all webpages. Zooming can be very useful. Visually impaired users may use zoom functionality to increase the text size on all webpages and it may also be used to increase or decrease the size of individual elements that are either too small or too large. Note that Chrome's zoom functionality is independent of the resolution, DPI setting, or font settings of the underlying operating system. Click on the Chrome menu (the three dots). The menu displays zoom controls. to make everything larger: click on the plus icon. to make everything smaller: click on the minus icon. full-screen mode: click on the full screen icon. The changes take effect immediately so that you see right away if the zoom level needs further adjustment. Ctrl and Mousewheel Up to increase the size of content on the webpage. Ctrl and Mousewheel Down to decrease the size of content on the webpage. Tip: Chrome indicates a custom zoom level in the browser's address bar. The browser displays a magnifying glass icon in the address bar on page's with custom zoom levels (custom meaning a different zoom level than the default). A click on the icon displays the actual level, e.g. 110% as seen on the screenshot above. You may change it with clicks on the plus or minus icons, or click on reset to reset the zoom level to the default value. Google Chrome remembers custom zoom levels across sessions and applies it to the entire site. 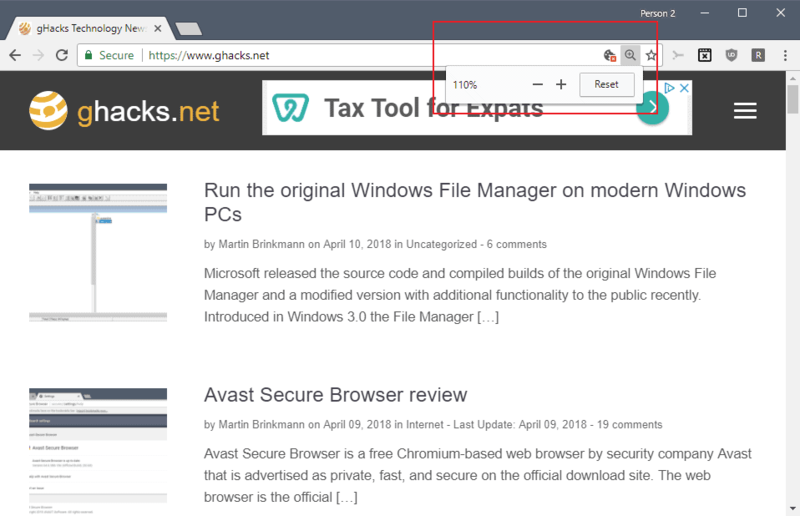 If you change the zoom on Ghacks to 110%, all pages on ghacks.net are displayed using that zoom level. You need to reset the zoom level for individual domains if you don't require zoom anymore. While you can change the zoom level of individual webpages, you can also change the zoom level globally in Chrome. 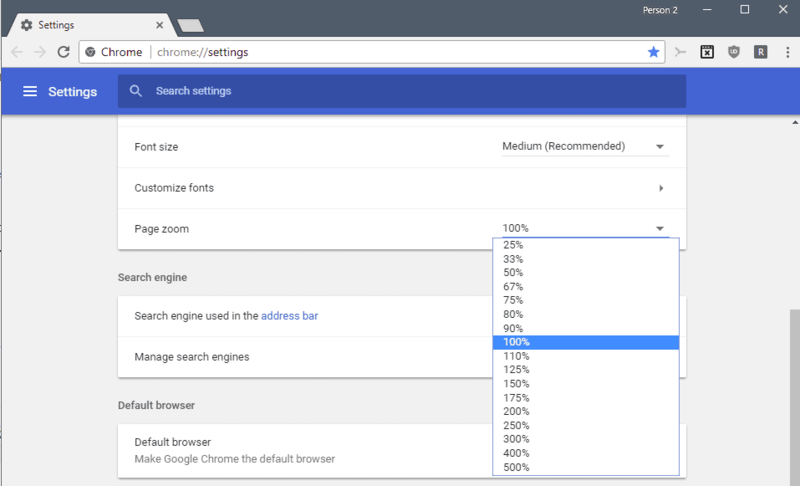 Load chrome://settings/ in the Chrome address bar. Scroll down on the page until you find to the Page zoom setting under Appearance. Switch zoom from the default value of 100% to another value. The change is applied to any webpage you open in Chrome except for webpages with custom zoom levels that you applied using the methods described above. 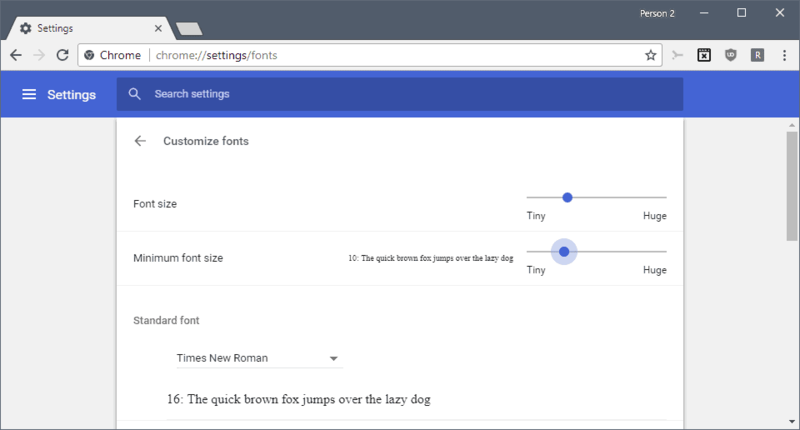 Tip: you may change font sizes in the Chrome settings as well but these are only valid if a site does not make use of fixed font sizes. Load chrome://settings/fonts in the web browser's address bar. Change font size to modify the size of text on webpages. Change minimum font size to increase the smallest size of text you are comfortable with. Change fonts to another font type. Photo Zoom for Facebook to zoom photos on Facebook without leaving the page. W Zoom adds support for changing the size of content on the current tab / per origin / per path only. Zoom for Google Chrome does only one thing: it adds zoom controls to the Chrome toolbar and it introduces more granular zoom levels (e.g. 97%). Zoom Page WE adds features such as text-only-zoom, automatic fit to width and more to the zoom experience. I find the chrome zoom controls rather cumbersome.I much prefer firefox/palemoon as the controls can be placed on the UI of the browser and is much easier. I agree, the option to display controls in the main UI are missing. You need to install extensions to add that functionality. I have to use an extension because browsers seem to refuses to include a very common zoom of 115. Zoom Page WE works perfect in both Chrome and Firefox. Indeed a really great web extension that Zoom Page WE 10.2 from https://www.gnu.org/licenses/. Not sure if you can input any arbitrary value but those work. You can set any zoom you like in Chrome without extensions, just by using dev tools on chrome://settings. See here: https://superuser.com/questions/463185/how-do-i-set-a-custom-zoom-in-chrome. I miss the “Fit to width” feature from Opera 12 (Presto). Zoom Page We seems to allow only the text to scale. I find scrolling the page zooms the map. manages to ignore that fact for me. Is there any way to switch off zoom on scroll? EZ Zoom works OK, similar to the built in FF zoom and you don’t have dig down to make it work, although you do have to click the icon to reveal the zoom control. It’s simple and doesn’t nag. In the chrome store. Strange that all browsers don’t have the same simple features most everyone would want. I miss global zoom on Firefox like Chrome, with permissions and such. Zoom Page WE for Firefox works, but I rather not use any extension for such a simple thing. On my Mac, I can’t use Control-Mousewheel to zoom Chrome, because that’s how you zoom the entire screen (i.e. at the system level) regardless of which program you’re in. The effect is very different from zooming within just the browser window. I’d like to use the same zoom combination as in Mac Firefox: Command-Mousewheel — but in Chrome it just scrolls as though I weren’t holding down Command at all. Anybody know how to make Command-Mouswheel zoom in Mac Chrome?